Yippee!! 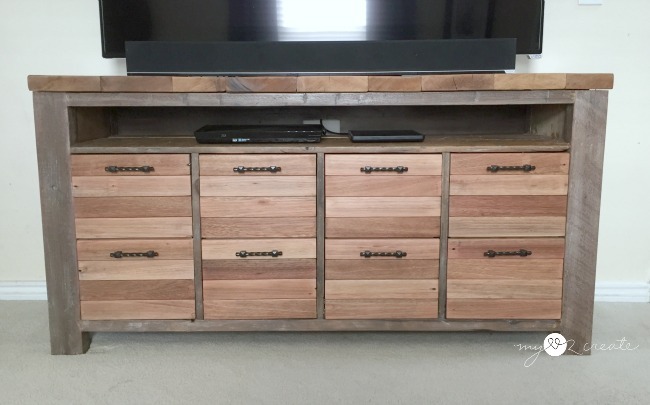 I am so excited to share my Reclaimed Wood Media Console with you, I have been thinking of making this project for a while so when Sandra from Sawdust Girl came up with the sCrap wood challenge I knew this was my excuse to get it done...and phew, it was a PROJECT! I am loving it, but more importantly my husband and kids are super excited about it, and that makes its all worth it! You see, we are a big "movie" family and so this baby is packed with awesome DVD storage, which it just what we needed. Once upon a time (just this morning) this is what we were using. It was a $200 cheap media center from Walmart that I bought over 6 years ago. 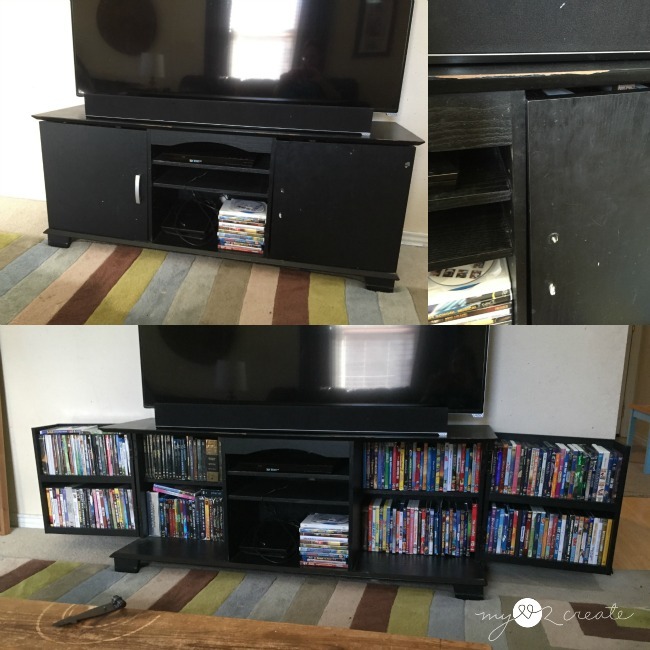 It had great DVD storage but we had out grown it and it was falling apart. 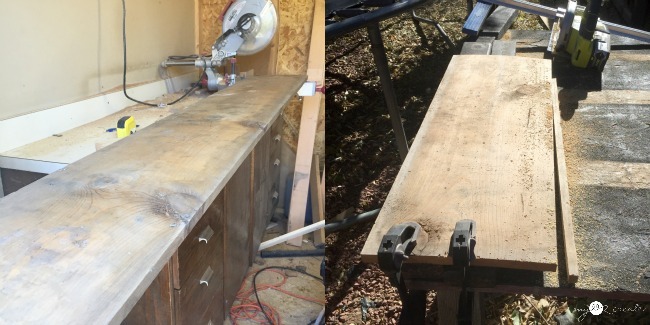 Several months ago I got these awesome boards from Craig's list for free, with a bunch of other wood and a cabinet that I turned into a bench. From the moment I grabbed them I keep seeing them as the legs to a media console...and it just wouldn't leave me. To Download these Plans click Here. 3- Five gallon paint sticks (free at Home Depot paint counter) (two are for top shelves, on will be ripped in half for bottom shelves or omitted because drawer slide holds DVD's in place. *Pre drill all holes for screws first. 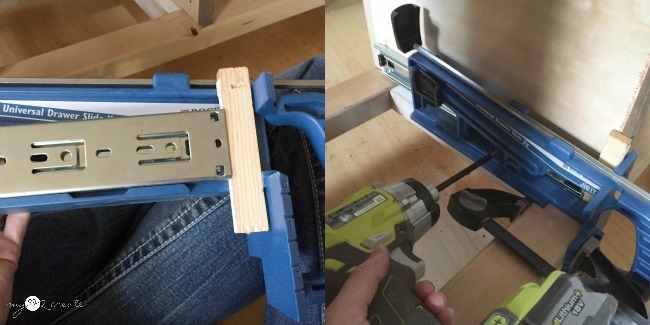 Start by connecting the legs to a side piece using 3/4 pocket holes and 1 1/4'' or 2'' pocket hole screws. You can use longer screws because the legs are so thick, it just adds more support, but is not necessary. Here I am measuring and cutting the beloved legs!! I used my Kreg Right Angle Clamp to secure it while I added the first screw, and of course don't forget the glue, my personal favorite is Gorilla Glue! 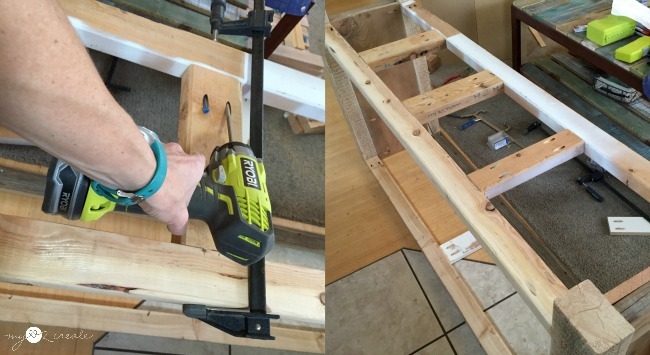 Next up is attaching the 2x4 trim, use glue and finish nails. Next you attach the 2x3 long supports or aprons. The bottom 2x'3 need to be 3'' up from the floor. The middle supports on the bottom are for support and for a place to screw in the middle dividers later. 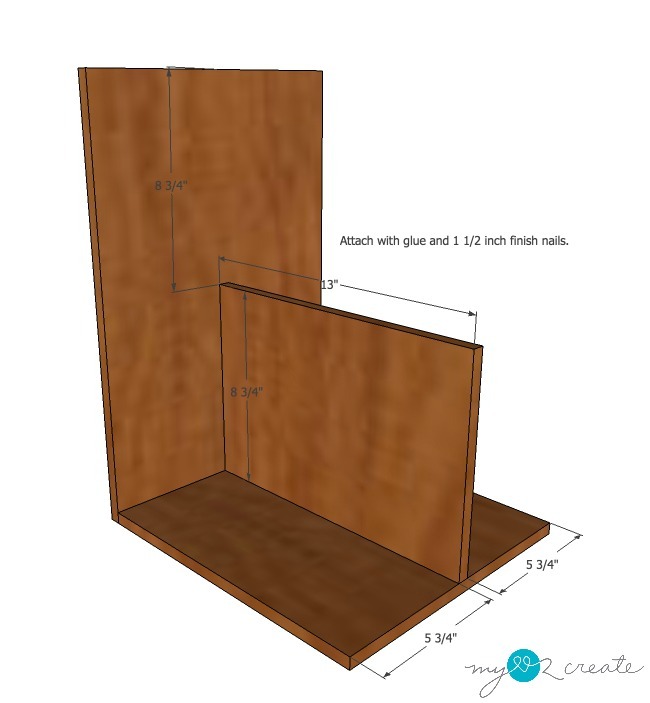 Attach them with 2 1/2'' pocket hole screws and glue. I flipped the console over so the pocket holes are on the bottom, but they could be attached either way. 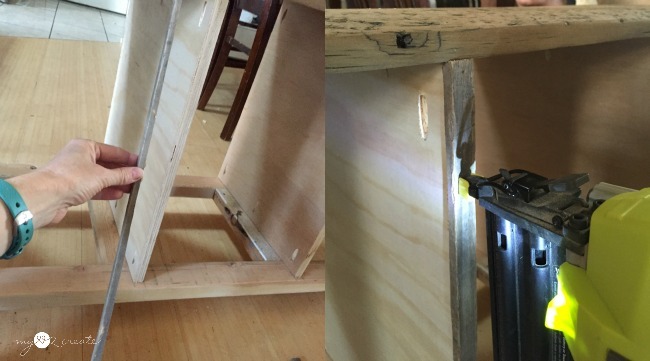 I also recommend using clamps when attaching with pocket hole screws. Once you have all your support boards added you can add the middle dividers. 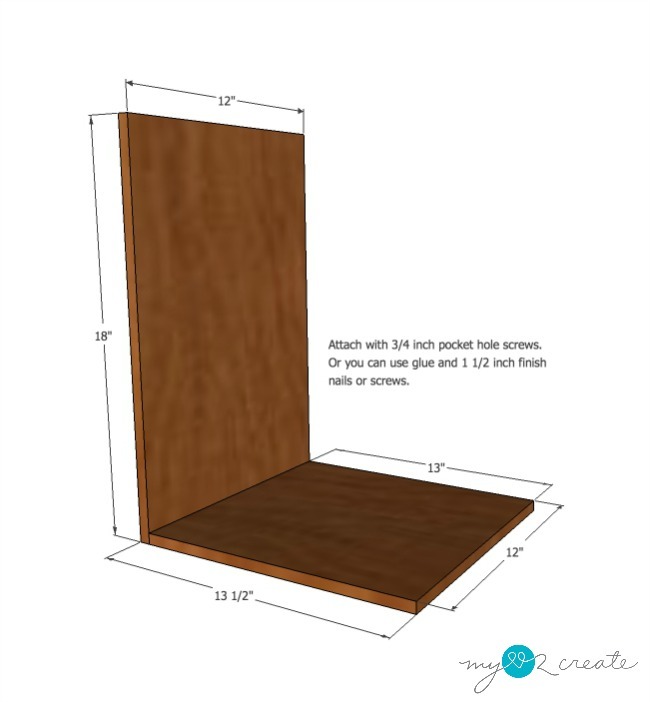 Attach them into the 2x3 and 2x4 support boards with pocket hole screws. 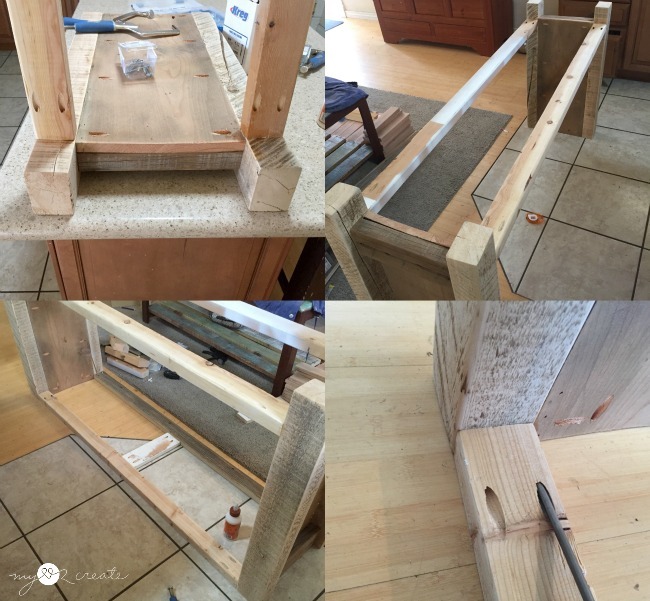 Then you add the shelf by attaching it to the sides and the middle supports with pocket hole screws. 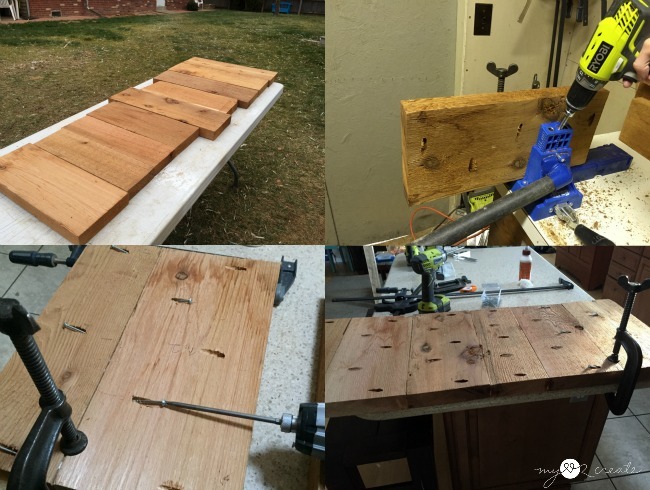 I used my Kreg Rip-Cut and Ryobi Circular Saw to rip one board down, and screwed the two boards together with pocket hole screws. The final shelf was so warped, that I ended up having to use it upside down in my media console...I didn't plan the pocket holes to go on top, but it was the best way it fit. 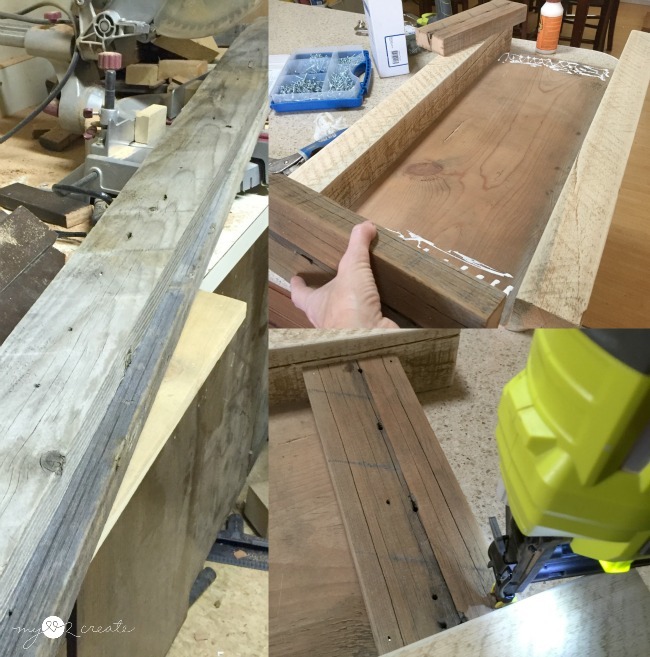 Oh the joys of working with reclaimed wood! 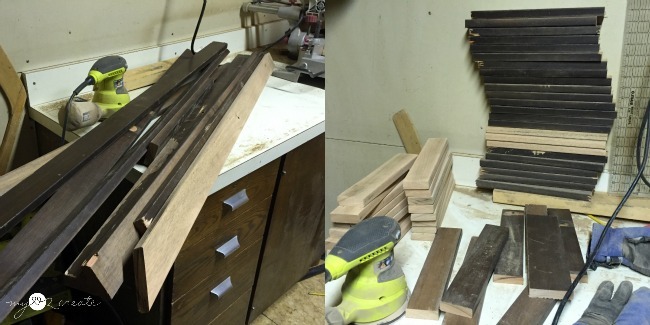 I wanted to show you a last minute change I made...I cut my middle plywood support pieces 3/4'' less than 16'' (15 1/4'') and then used scrap pieces left over from my sides and glued and nailed them to the front of my three dividers...just to keep the reclaimed wood look. This is totally optional, but it gets rid of the plywood edge. For my top, I needed to get creative. 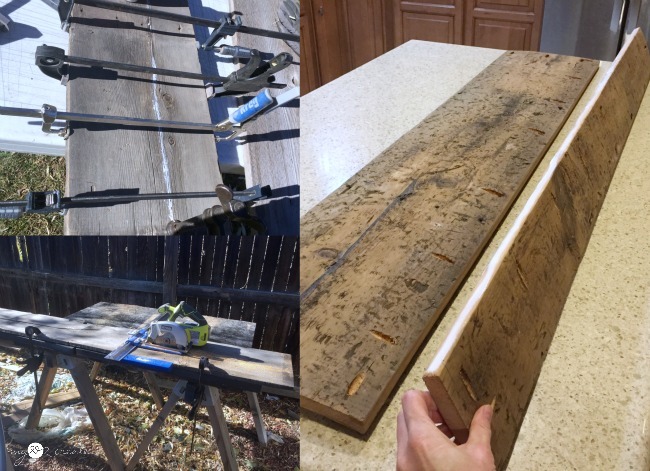 I ended up using some left over 1 1/2 thick cedar planks my father-in-law gave me that were left over from when the city replaced his back fence. I just had enough! I cut them to the correct width and then drilled pocket holes with my Kreg K5 Pocket-Hole Jig and used glue and 2 1/2 pocket hole screws to attach them together. One of the planks was too long so I used my Kreg Rip-Cut and Ryobi Circular Saw to make it the correct width. Since it was too thick for my circular saw blade to go all the way through, I cut one pass, flipped it over and cut all the way through on the second pass. To attach the top I flipped over the console and pre drilled holes through the 2x3's and drilled 2 1/2 inch screws into the top. For my drawers I pulled out all my scrap 1x2 plywood I could find, I ended up having to use mdf too. I ripped enough for 4 drawers. Brrr, it was cold!! 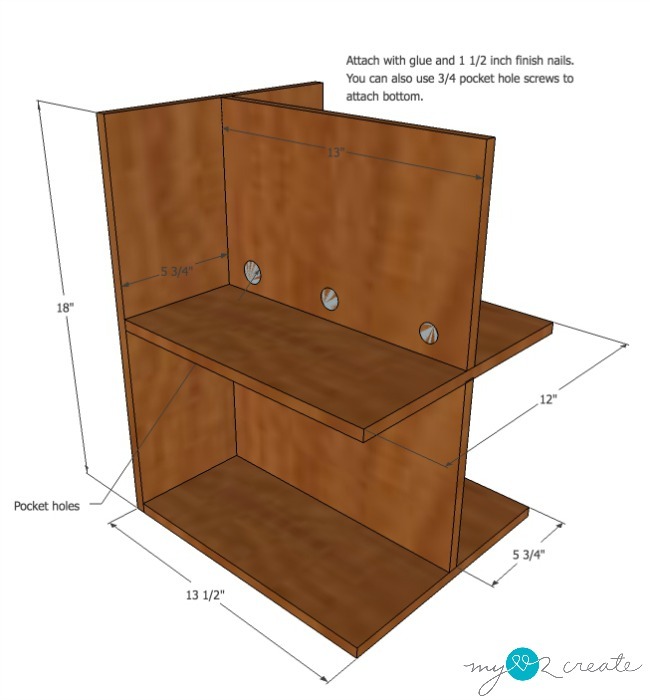 I drilled 1/2 pocket hole screws in the bottom pieces and middle supports for building the drawers, you will need 1'' screws for these small pocket holes. I also used my Ryobi Nail gun to nail the dividers and front and backs. It was very useful to measure where my dividers would be so I could accurately nail them together. Step 1: Attach the bottom to the front board, with pocket hole screws on the bottom side. 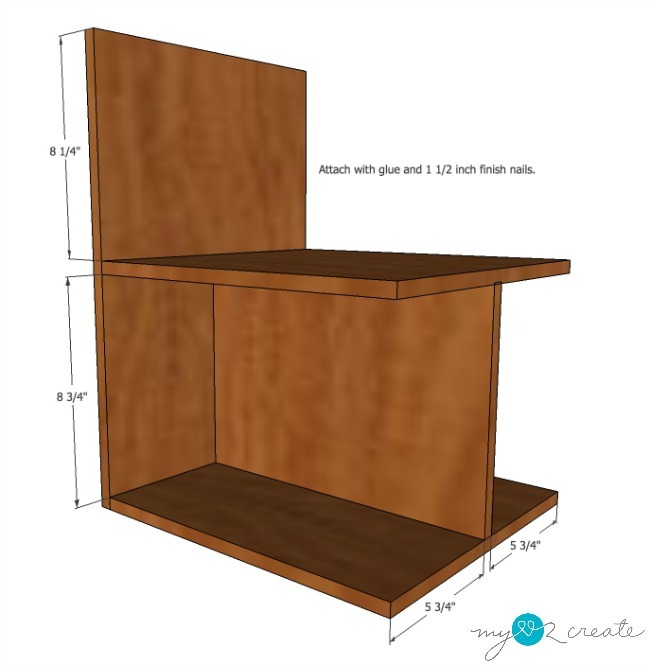 *I did not use 3/4'' wood on the bottom, but I would recommend it, for easier attaching of the drawer slides later. 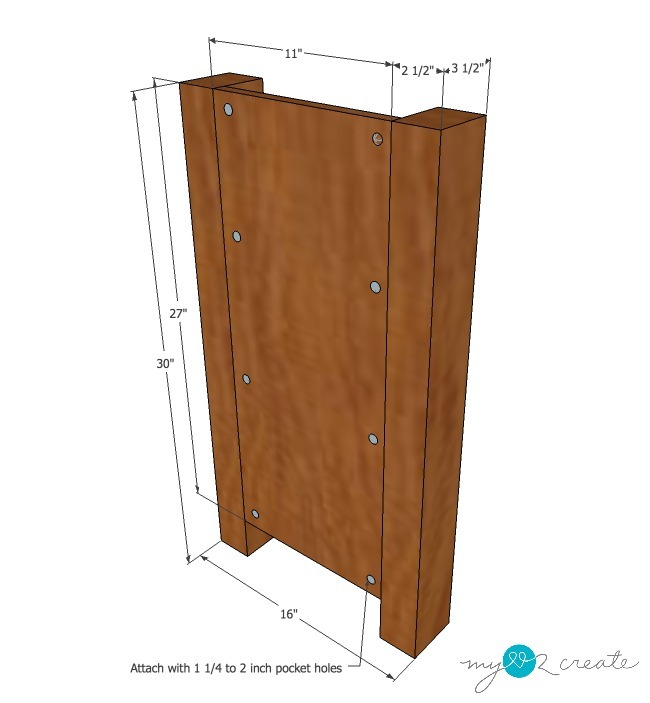 Step 2: Attach bottom middle divider, using pocket hole screws or glue and nails. Step 3: Add middle shelf. Step 4: Add top middle divider. 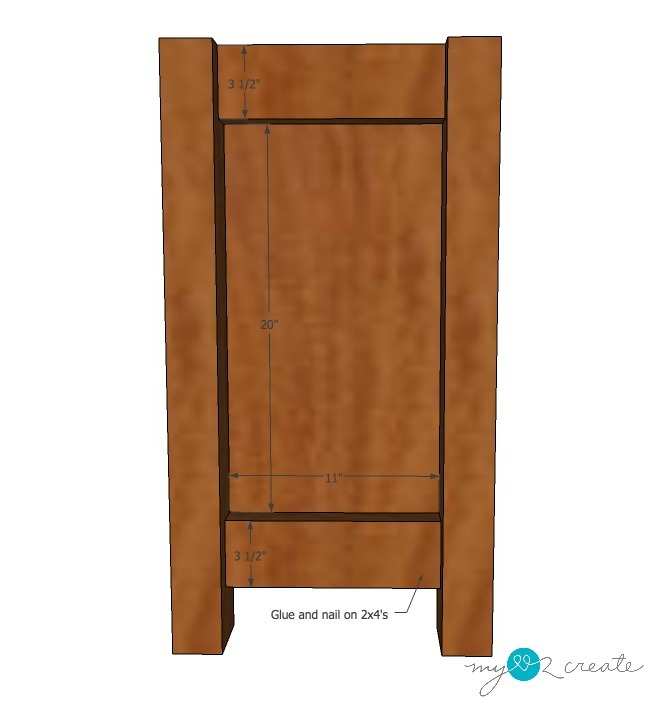 Step 5: Add the back piece, using pocket hole screws and glue and finish nails. Step 6: Add DVD stoppers. I used 1/4'' 5 gallon paint sticks which are free at Home Depot. for the Bottom I ended up ripping a paint stick in half so it wasn't too tall. Then I just glued them all in place. 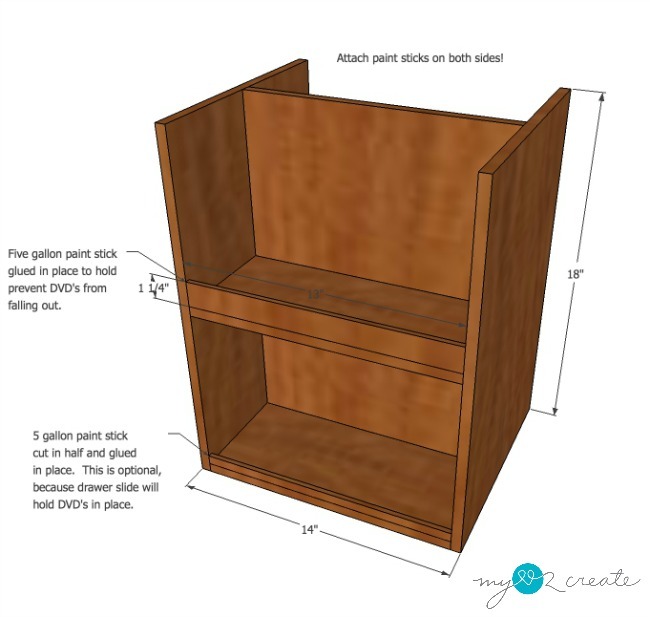 You can do the drawer fronts any way you want. 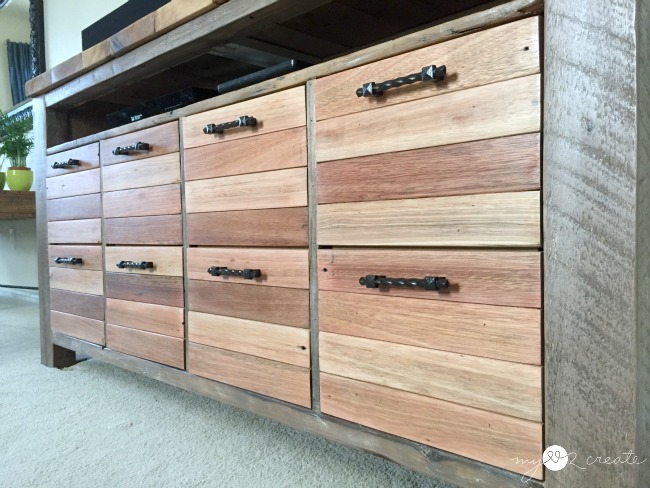 I gave you the over all size, and made the look of two faux drawers, when there was only one, but you could make it look like one drawer as well. For mine I used the wood pictured above, which was given to my by my father-in-law. It was from an old pottery barn outdoor lounge his neighbor was throwing away. He chopped it up and gave me the wood! 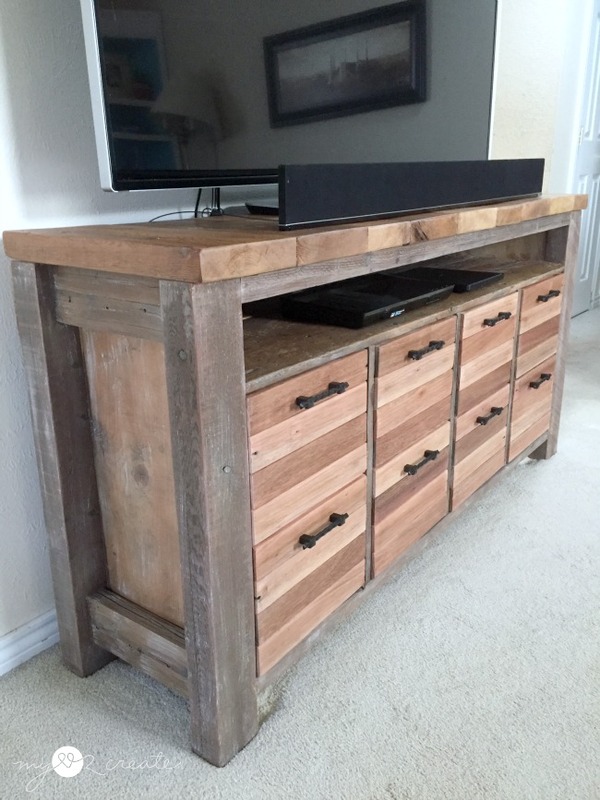 :) You can see my Kids Storage Bench I made from this same wood here. 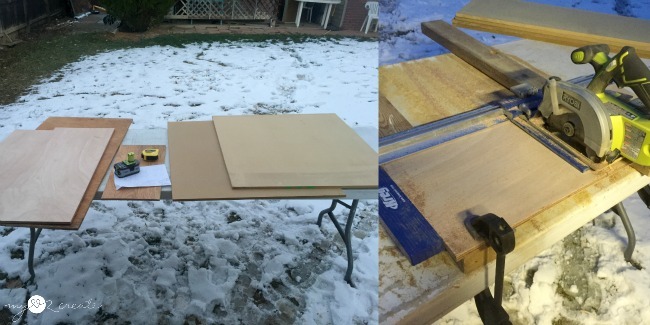 I cut all the slats to size and spent FOREVER sanding them down...in the cold! Yeah I was really doubting myself at this point. But lets back up a minute and talk about installed drawer slides. 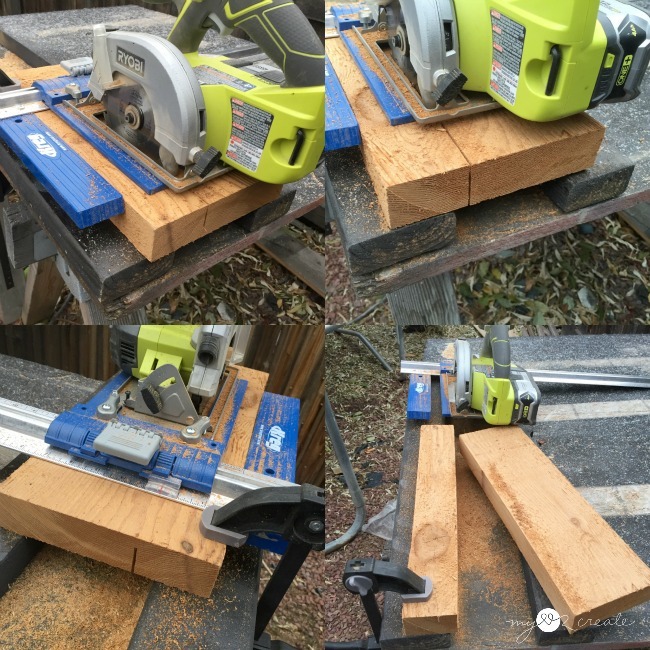 I used my new Rockler Universal Drawer Slide Jig. You guys...I am not kidding, I do not know how I lived with out this!!!! BEST jig EVER! (and they are not paying me to say that!) I love this thing and first used it on my kids lego tables from the boys room, which I hope to share with you soon! Anyway I needed the drawers inset 3/4'' back (so I could add my drawer fronts and have them flush with the front), so I jigged the jig, and added a 3/4'' stop so that my slides would be in the right place! It worked great and they were super easy to install! Yip yip yippee! So yes, you need to install your drawer slide 3/4 back from the front of the middle dividers. Use full extension slides so that you have full access to your DVD's. My next task was making the piece look like it was meant to be together, instead of a bunch of mis matched wood, which is what it was. I ended up using my good old natural stain, vinegar and steel wool, which I first used on my Camping Crate. 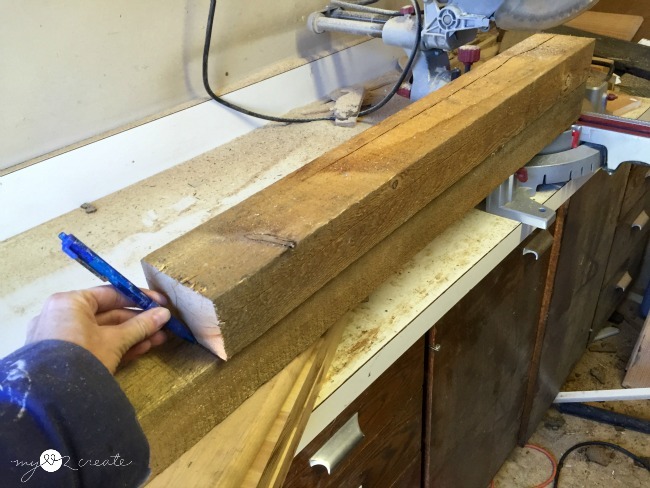 I used it on the console table parts that looked like newer wood. 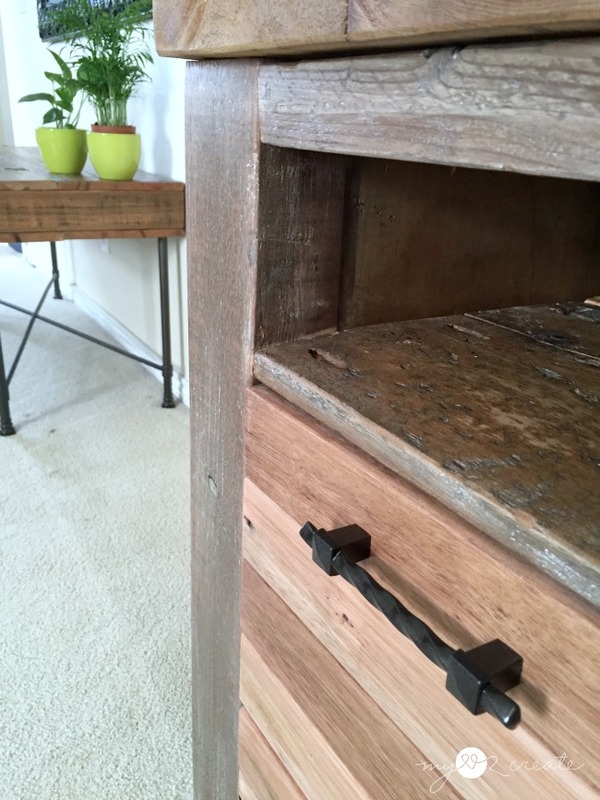 Then I used Natural stain on my top and drawer front pieces. I finished the whole thing with 3 coats of poly sanding with 400 grit sand paper between coats 1 and 2. 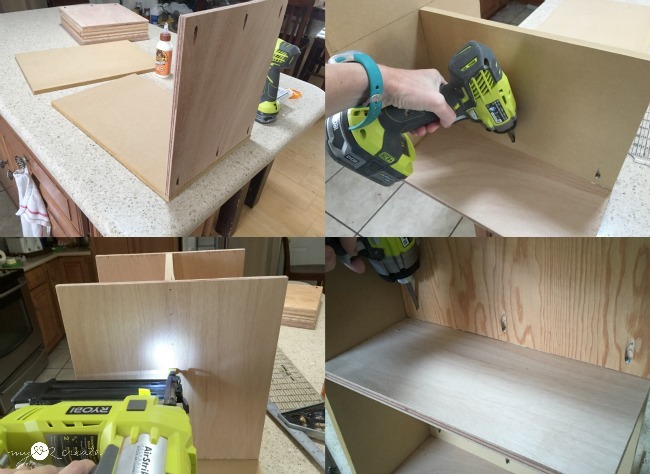 To build my drawer fronts I glued four boards together. 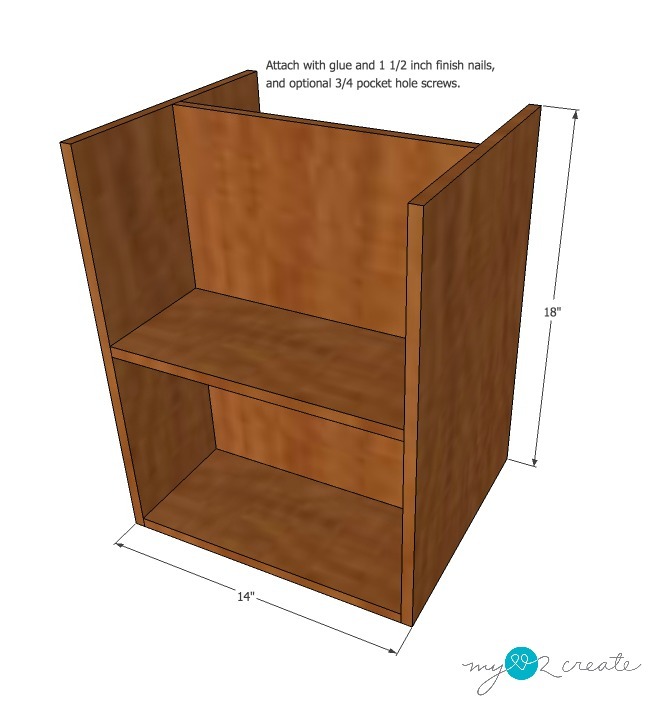 Then I installed my drawers, and put glue on the back of the four piece section. Next, I placed it on the drawer and held it so that it was in the right place and then nailed it on. 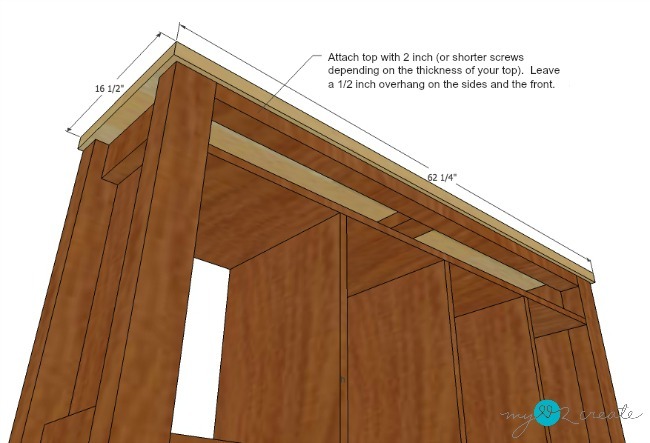 You will need to leave 1/8'' on all sides. Last, I added my bottom four piece section, and because I was out of shims I used table knives to hold them at the right height for nailing on the bottom piece. 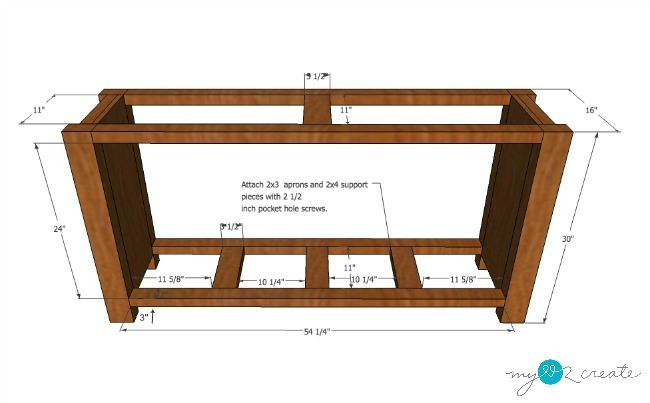 Here are the dimensions for the drawer fronts. Our DVD storage has room to grow now! I gave my oldest son the task of organizing the DVD's and he did a great job! 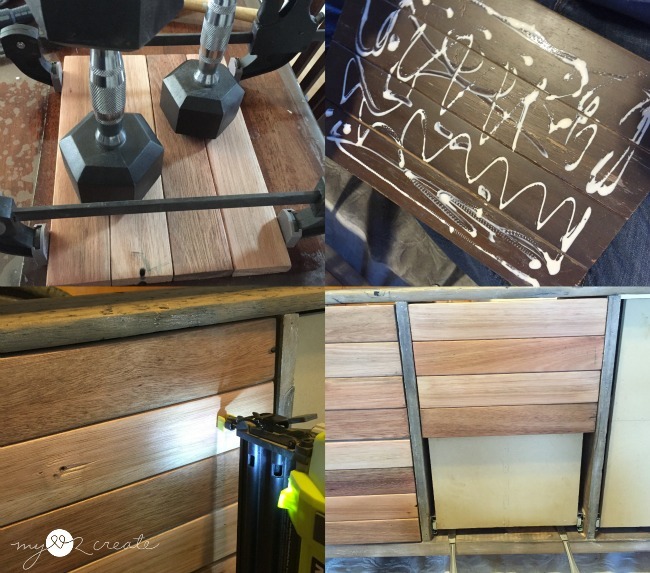 It is far from perfect, which is how it goes when you work with reclaimed and scrap wood, but I have learned to embrace the imperfections! The color is so pretty, but I had a hard time capturing it on camera. This is the new look from the couch. Much better right? Sunny thinks so, she kept laying by it. I had to bribe the kids to play with her so I could get some shots without her. I am glad I went for the faux drawer look...It kind of makes me happy. We brought up this rug I had in the basement...since the other one had been chewed by the photo bomber above. 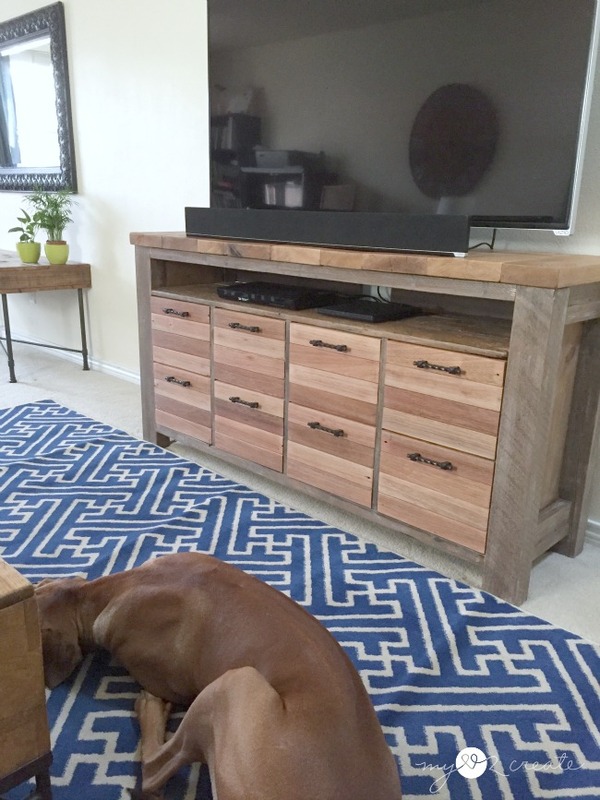 It may or may not stay, but for now it is a fun pop of color for our new Media console, and now...I just want to sit and watch a movie! Thank you for sticking with me on this marathon post! 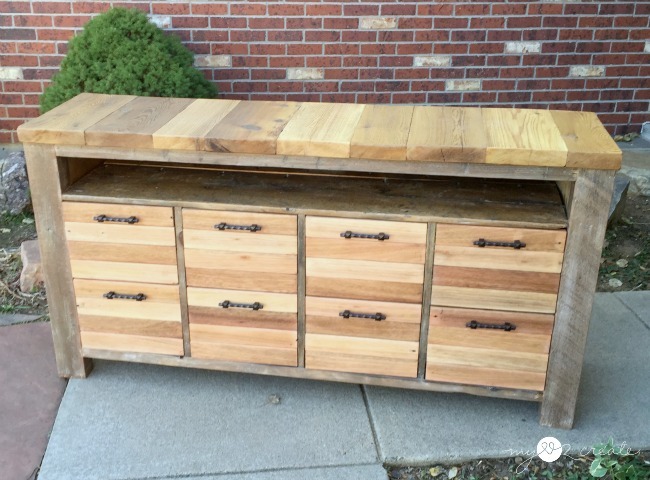 If you haven't yet, I would love it if you linked up your own scrap wood project here!! I need more ideas of how to use up my scrap pile, this project used a lot, but I still have a lot more! Goodness... this is absolutely gorgeous Mindi! Mind blown. WOW! That is amazing! I love everything about this gorgeous console! 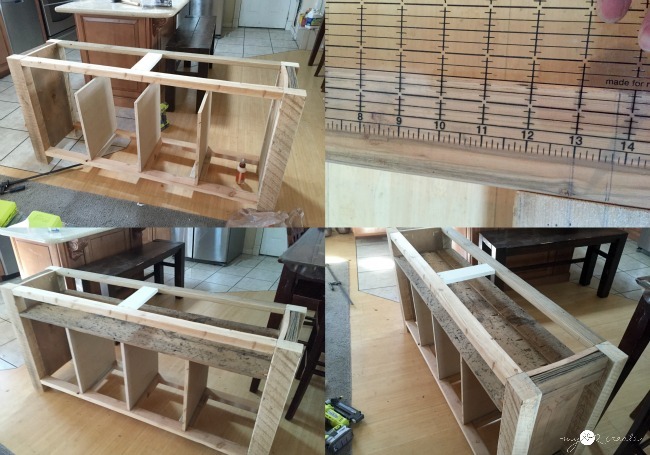 Awesome project, Mindi! So much storage! Love it Mindi! 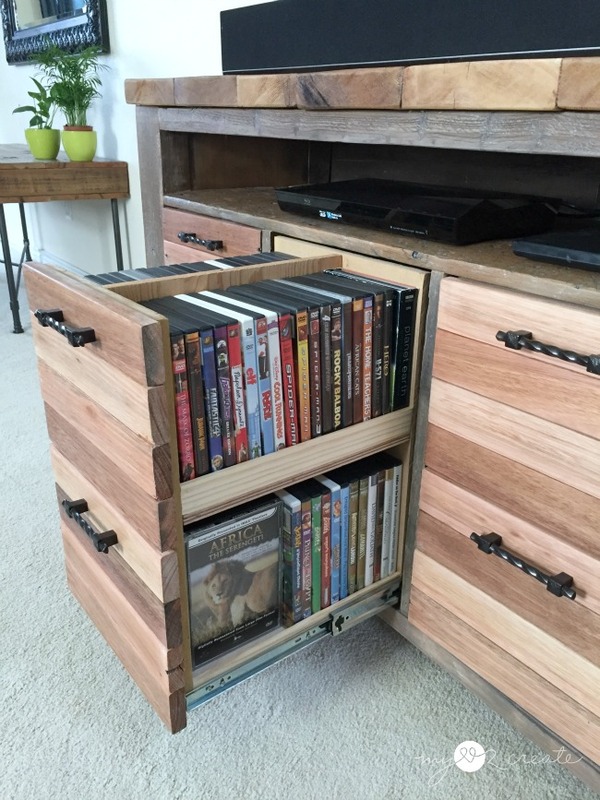 Love the look and all that storage! Wow! This is exactly what I've been looking for thank you so much for sharing! Pinned. your creativeness never ceases to amaze me! 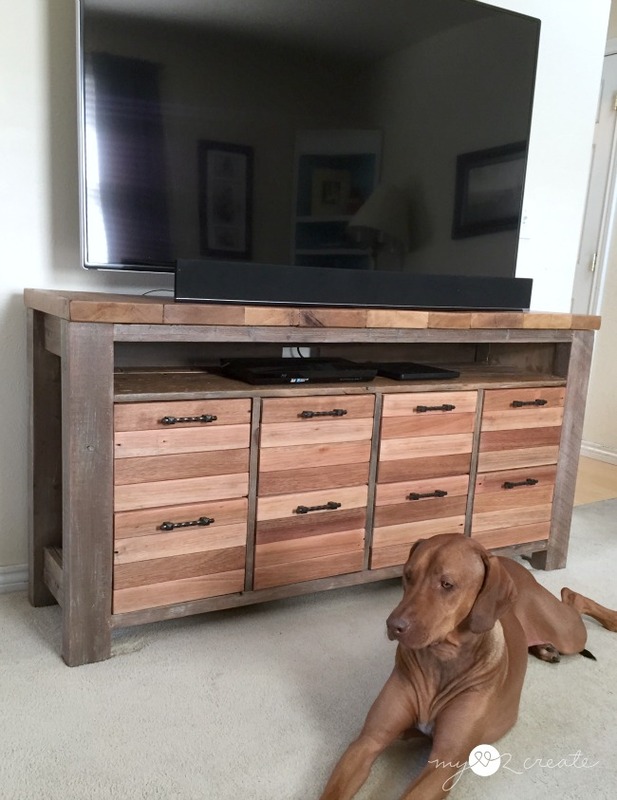 I'm in awe of your media console Mindi! Beautiful job, and soooo functional!! This is seriously gorgeous!!! 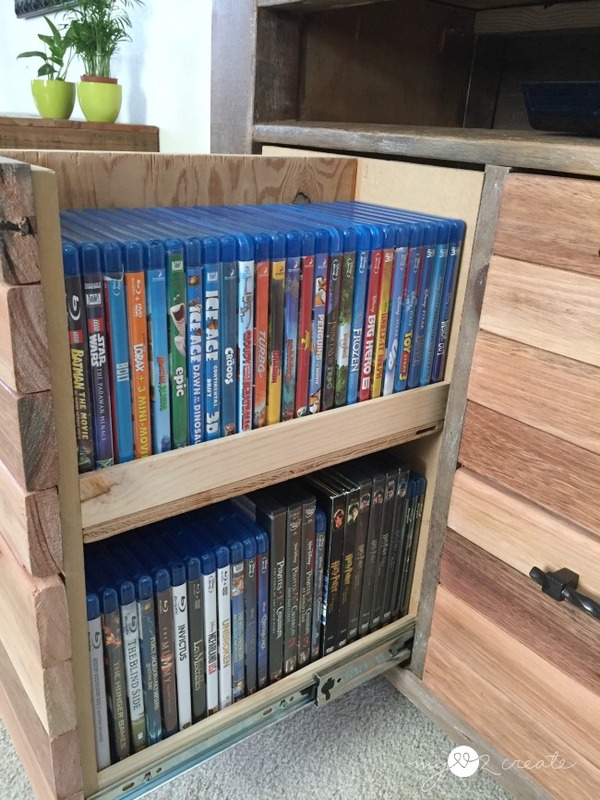 And those drawers are the perfect size for holding DVD's! I love it! This is stunning! I love all the storage too. I am loving this!! and it's built super sturdy. Long life to the new media console!!! I have updated the post with the link to the plans in PDF format. I LOVE this!! It is so rustic, yet clean and modern. 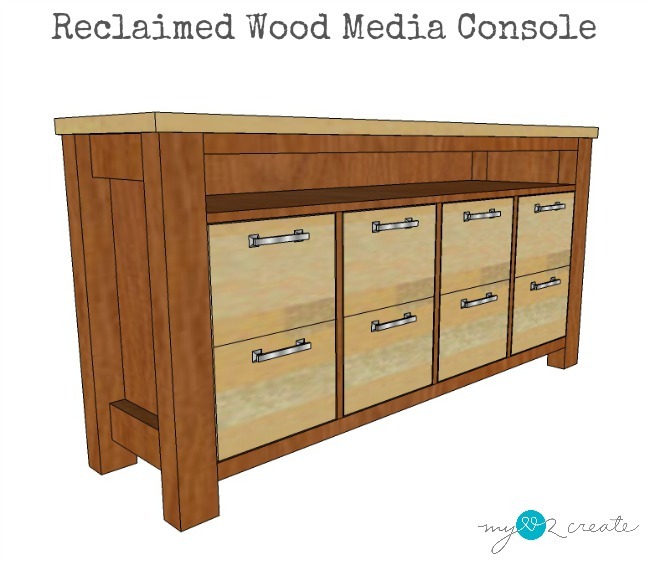 We have been trying to come up with a good media console idea that would allow us to store all of our movies (they currently fill our hall closet!). This is a fabulous solution! 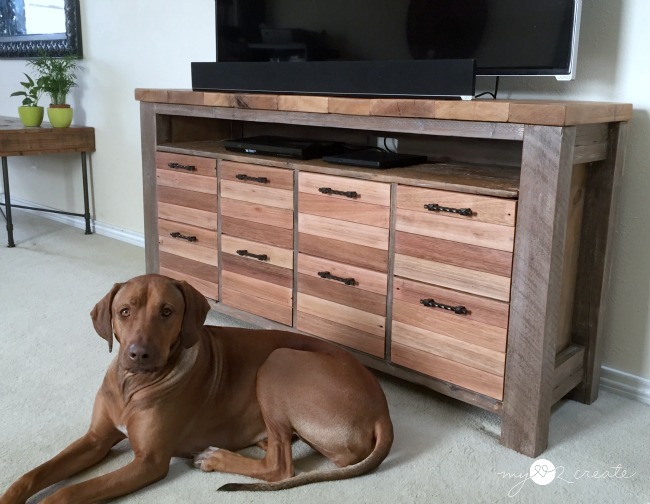 What a great tutorial and just amazing project you did on the Reclaimed Wood Media Console. Love the finished product. Thank you for sharing with the Clever Chicks Blog Hop! I hope you’ll join us again next week! You did such a fantastic job on this! Love the look! This really is a gorgeous piece. I love the two toned wood! Thanks for sharing with SYC. Seriously Love This! Pinned & Shared. Thanks for joining the party! 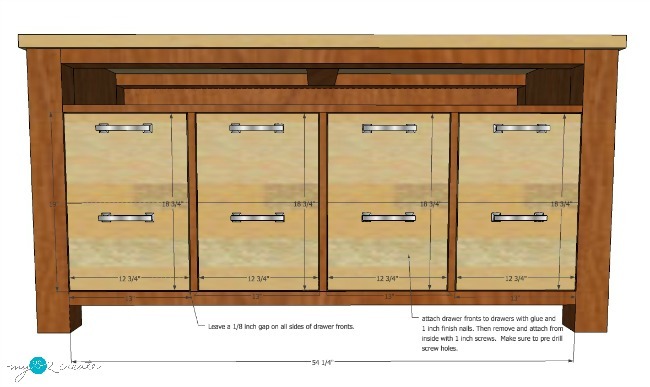 Love how the front of the drawers look. Very eye-catching. Plus the dog, my dog is such a photohog! What an awesome project!! I can't wait to show this to my husband. He's going to love it as well. I'm featuring your project tonight on "Best of the Weekend". This is amazing! You are so crazy talented! Thanks for linking up last week at The Creative gallery link up, I have chosen this as a feature for this weeks party. I am excited to see what you have chosen to link up this week. The party is now live. This is fantastic and such amazing detail in your tutorial. We're getting ready to sell our home and move - I'm thinking something like this would be awesome to build with book shelves to match at our next place. Love this! Wow, this is amazing! Thanks so much for all the great details and the plan. What an amazing build! 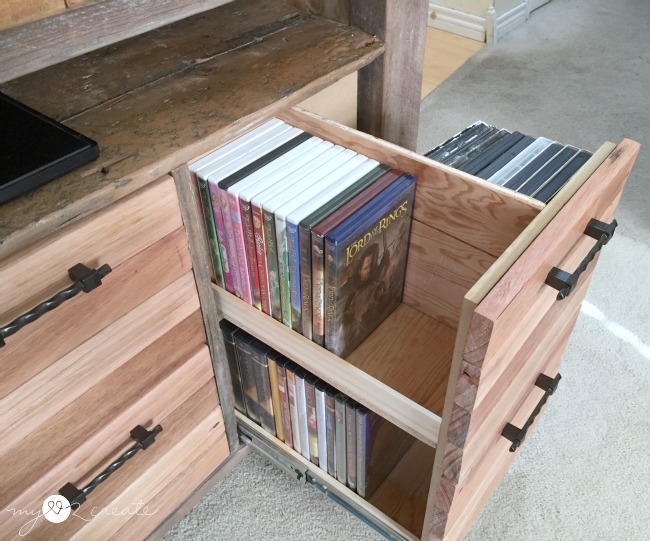 the storage is amazing and perfect. 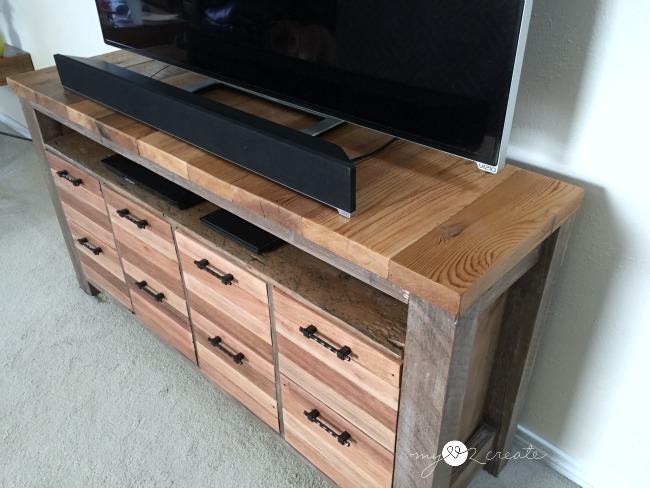 saw this featured on remodelaholic, and had to come by and tell you how awesome it is. That is a gorgeous console! ~I really love the beautiful wood tones! WOW!!! This is really gorgeous! 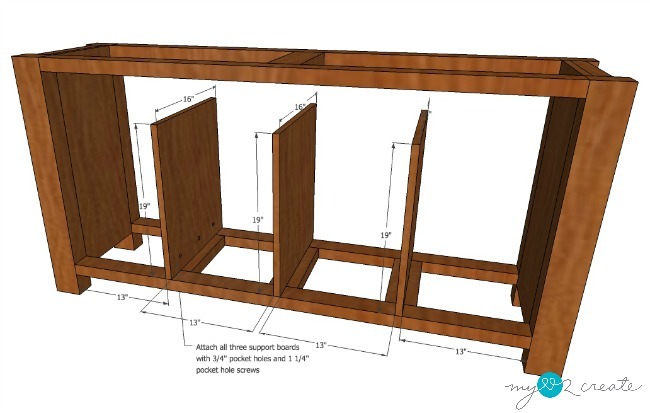 This is a great design, and now my wife wants me to build it. 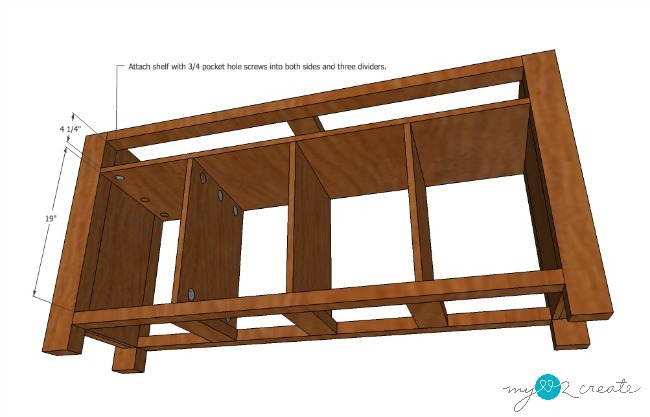 Did you do this in SketchUp? If so, can I download the SketchUp file? I need to modify some of the dimensions to fit the space we have and the equipment I'm going to put in it. Thank you so much Craig! 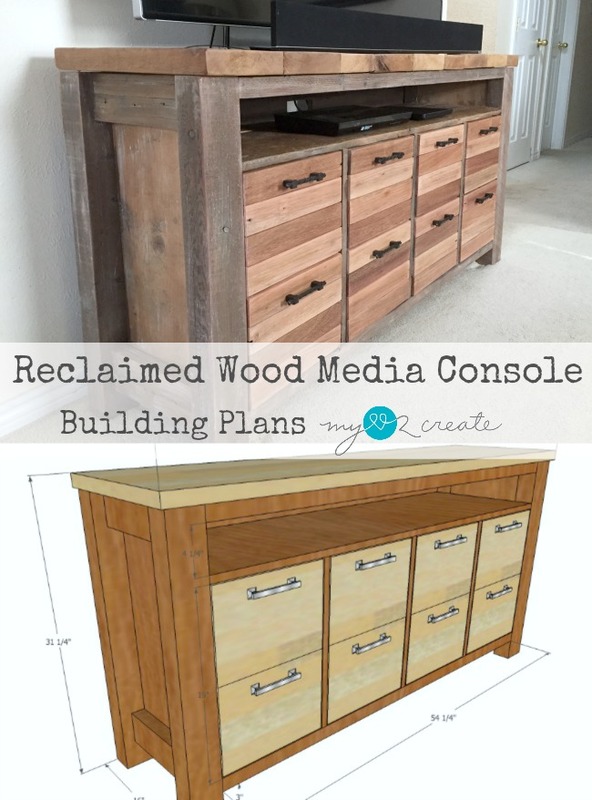 Yes, there is a link to the plans near the beginning of the post under "How to build a Reclaimed Wood Media Console" hope that helps! If you build it I would love to see pictures! You can share on social media and tag me in the post so I can see!